Seventeenth-century Lombardy was home to more published nun composers than anywhere else in Italy. Women such as Isabella Leonarda (author of 20 collections of vocal and instrumental music), her sister Ursuline nun and composer Maria Xaveria Perucona, Caterina Assandra (composer and dedicatee of various motet collections), Chiara Margarita Cozzolani and her conventual sister Rosa Giacinta Badalla, and other nun composers from Lombardy provide a portrait of a musical world which is today as fascinating as it is unknown. 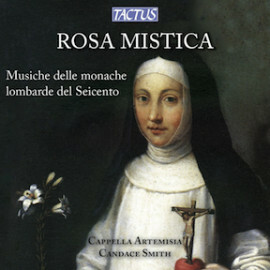 Rosa Mistica was awarded special mention by the Premio Vivaldi of the Fondazione Cini in Venice 1999.